Wall Stree Journal – Trip Planning Apps Get (Very) Personal – Tourlina mentioned as one of three apps! Because our market research shows, that women like to travel and prefer a female travel partner as having a male travel companion often leads to dating. 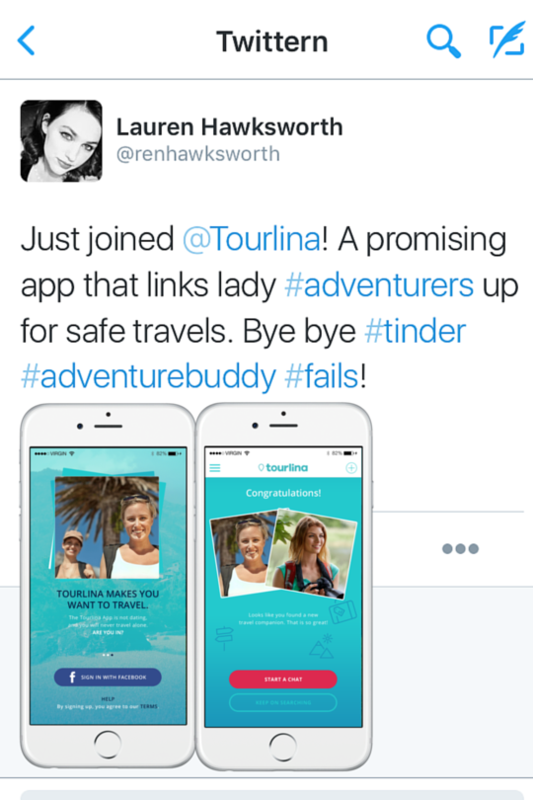 As far as we know, there is currently no other app available, which empowers women to find a female travel companion. Tourlina empowers women around the world to create new connections while they are travelling that otherwise might never have been possible. Tourlina empowers women to travel the world and make new female friends. Tourlina rates quality over quantity! Our passion – help to make travelling more secure and more fun for women. Tourlina was born and raised in Frankfurt/Main, Germany. The Tourlina management team consists of Michael Klumpp, Founder and Sandra Preuss, Co-Founder. Tourlina is self-funded! If you are interested to support our fast growth, please contact us! As we are for 19 years within the travel business (winter and summer), we often got in contact with women, who like to travel, but don´t know how to find an interesting female travel buddy. They don´t like to use Tinder or other platforms for this as they are more dating. Free download for iOS, Android followed end of April 2017. Similar matching like Tinder, but every profile is verified (only woman/ not fake/ not man). In addition, fly around and connect with locals in other cities all over the world. Where do most of the women who connect with Tourlina want to go? Currently, South America, Central America, Asia and the USA! What are some key factors that make Tourlina safe? Every new user is checked and verified by our team. We have a look at the Facebook account of new users to verify this. If we are not sure, we ask for additional information (photos, other social media accounts). In addition, we monitor what’s going on in the app. If a user gets blocked by other users, we will immediately unverify this user and get in contact with this user. So far, we haven’t had any issues with fake accounts, and we have thousends of users.